When you want to capture that special moment, the last thing you need is a failed Bluetooth® connection, a broken cable, or a wobbly Selfie Stick. You certainly don’t want your battery failing when you press the shutter! You wouldn’t be very happy pressing the button to find nothing happens. Fortunately, you never have to worry about those problems ever again! More than just another Selfie Stick, the Orbit Pro allows you to take great photos and videos anytime, any place, anywhere. Designed to protect your valuable cellphone and connect to any compatible device, it’s guaranteed to capture every special moment forever. And thanks to our work with Sightsavers International, a registered charity, your purchase helps save and restore the sight of children and adults in Africa and Asia. The Orbit Pro is the ultimate accessory for people who love Selfies but who know that, in life, you always get what you pay for! As Selfie accessory specialists, our products are often imitated but rarely equalled. The Orbit Pro is guaranteed stronger, sturdier, and more durable than other cheaper imitations. That’s why our products are consistently rated 5-stars across our entire range. And for added peace of mind, it even comes with a Lifetime Warranty. Try yours for 30 days, 100% RISK-FREE or your money back! You won’t be disappointed! DON’T DELAY – GET YOURS TODAY WHILE IN STOCK! STRONGER, MORE DURABLE, & FUNCTIONAL THAN ALL MAIN COMPETITORS – Not all Selfie Sticks are the same! 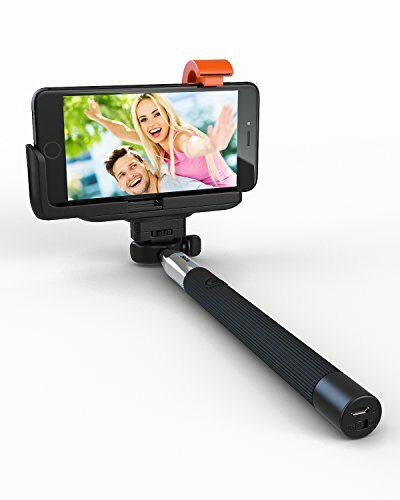 Improved, strengthened, & extendable to 100cm (39 inches)…it’s the Selfie pole with 7 built-in functions: (1) ALL Apple iPhones (2) ALL Samsung Galaxy cellphones (3) Most Android 4.2+ smartphones (4) Galaxy Note series (5) Compact cameras (6) ALL iPod Touch (7) ALL popular camera apps. TAKE MORE THAN JUST SELFIES FOR WONDERFUL MEMORIES YOU’LL TREASURE – Open the door to a world of new photographic opportunities! Take stunning self-portraits, amazing aerials, impossible close-ups and finally get everyone in your group photos. Pole extends up to 39 inches for superior wide angles.